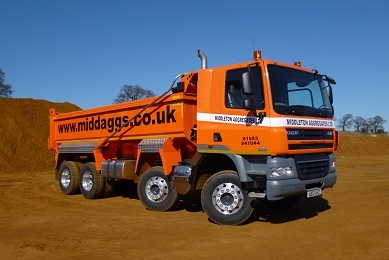 Here at Middleton Aggregates we have several vehicles available for hire. Ranging from our Low-Loader which can carry up to a thirty five tonne payload, to our grab lorry with a mounted crane able to lift bagged aggregates into areas otherwise inaccessible. We also hire out our four and eight wheeled tippers so you can keep your site managed efficiently and without delay. 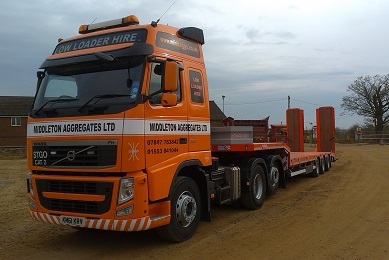 Our Low-Loader is often used to move plant equipment to sites all over the UK as well as our local area encompassing Norfolk, Suffolk, Cambridgeshire and South Lincolnshire. We have one lowloader vehicle available for hire capable of moving a large variety of equipment to and from sites across the UK. Our drivers are highly skilled and have many years of experience between them, so your precious cargo will be in safe hands. Also available for hire is our beavertail plant movement truck which is regularly used to move smaller plant equipment from site to site. 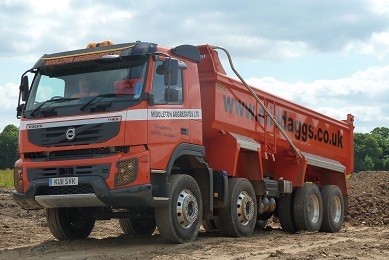 We have four and eight wheeled tippers, along with a 6 wheeled grab lorry available for day hire, be it moving materials between sites or to a third party landfill. Tipper and Grab day hire includes an experienced driver to operate the vehicle. We offer competitive rates and pride ourselves on the level of service provided to our customers. 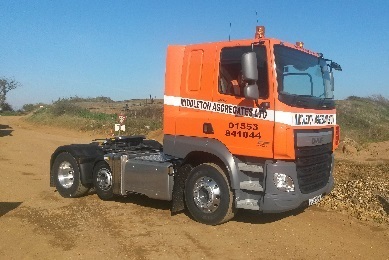 If you would like to arrange day hire of a tipper or grab lorry for your site, please give us a call and ask for either Andrew Simmons or Owen Nicol.